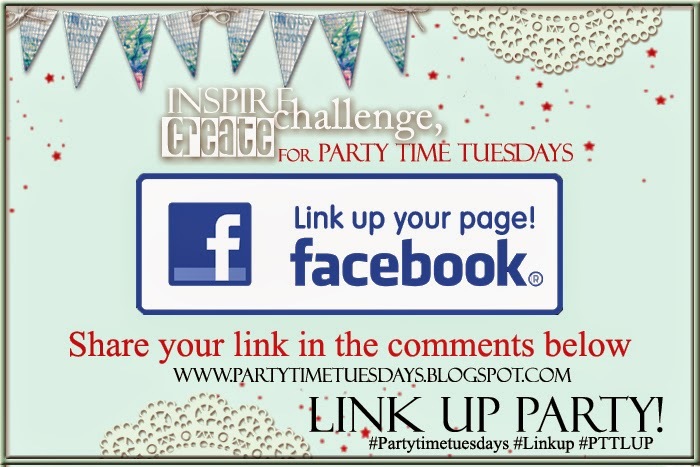 We are hosting a Facebook Link UP Party on our Party Time Tuesdays Facebook Page! Join us! Do you have an Artistic/Crafty/Creative Facebook Fan Page? Would you like to Network with other Creative People such as yourself? Would you like to expand your Facebook Reach to more readers? If you answered yes to any of the above questions then you need to join up and participate in this quick and easy Facebook Link UP Party! How it works, what it does for you! Click on any link in this post and it will take you to the Party Time Tuesdays Facebook Link UP Party. Copy and paste your creative Facebook Fan Page in the comments to the photo image like the one below. Follow the simple steps of participation outlined in the photo's description. Meet new people, network with other creatives and watch your fan base grow! Be inspired by others and inspire other's with your work! Artists, Creatives & Designers helping one another is what this is all about! Help us spread the word, share this post or the Link Up Party on our facebook page.